On Jan. 24 it will become apparent whether the warring parties in Syria will accept a negotiated solution to the three-year conflict that has already ended the lives of over 100,000 people and displaced 2.3 million from their homes, while some 9.3 million people are in extreme need of humanitarian aid. Representatives of the government of President Bashar al-Assad and delegations from the rebel forces that have been fighting against it since March 2011 are due to meet on that date in the Swiss city of Geneva. So far, neither side has given a clear indication of its willingness to participate in the talks, in what are apparently delaying tactics aimed at strengthening their bargaining positions. Prospects for the negotiations appeared to shift in recent weeks as infighting broke out among opposition forces. A source who is well-informed about the internal situation in Syria told IPS that some opposition groups want freedom in order to combat other forces that are also opposed to Assad. At the moment, “the more moderate groups are succeeding in military operations against the more radical Al Qaeda groups,” which are completely opposed to a ceasefire, the source said. The Geneva 2 conference, organised by the United Nations, will open formally on Wednesday Jan. 22 in Montreux, on the northeastern shore of Lake Geneva, at the opposite end of the lake from Geneva itself. The Montreux meeting will be attended by governments from 30 countries and delegates from international organisations, as well as U.N. representatives headed by Secretary-General Ban Ki-moon. Participants are likely to deliver exhortations for peace and to be largely critical of the Assad regime. In the last few weeks the United States and Russia have intensified efforts to guide the negotiations towards two primary goals at this first stage: achieving a ceasefire and opening up corridors for aid to reach those most in need. David Harland, the executive director of the Centre for Humanitarian Dialogue (HD Centre), a prívate organisation based in Geneva, said the best solution for the difficult humanitarian situation is to deliver aid with the cooperation of the government and all parties. Most convoys have been blocked because they have not received approval from the Damascus government, or because of fighting, or by criminal gangs or extremists, Harland said. “It’s now very hard to carry out humanitarian operations in areas controlled by the opposition,” he said. In the run-up to the conference, it is Harland’s view that a ceasefire may be very possible in areas where the opposition forces are surrounded, as in the Houla region and the city of Homs, in the western province of the same name. A ceasefire will also be possible in areas where the government is holding out in enclaves within territory controlled by the opposition, as in Dar’a and Dayr az Zawr, in the northeast, and Idlib, in the north, he said. While maintaining a low public profile, the HD Centre successfully offers mediation services and specialises in armed conflicts. In Syria, Harland, a former diplomat from New Zealand, has held meetings with Assad and with leaders of the armed opposition. On the basis of these, Harland believes that “Geneva 2 will not end the war. It can’t,” he underlined. The Geneva process has assumed that the U.S. and Russia have enough common ground on Syria to move things forward. So far, over a period when over 100,000 people have died, this has not been the case, he said. The problem is that the Geneva process has not found a way to give much voice to Syrians active in the opposition on the ground. “This will have to change if the peace process is to gain traction,” Harland said. Geneva 2 will be a success “if it opens the door to a new type of peace process,” he said. A successful peace process would have to be informed by the Syrian people themselves, but implemented with help from the outside. “It would have to be a minuet: consultations with the Syrians on the ground, and then decisions taken by the U.N. Security Council on the basis of those decisions,” he said. “I think that we need a mechanism where all of the players who are shaping the reality inside Syria are present at the discussions and are held accountable,” he said. In Harland’s view, the Syrian conflict resembles the 1992-1995 Bosnian War which resulted from the dismemberment of the former Yugoslavia. Both Bosnia and Syria exhibited internal political issues and internal ethnic religious issues, he said. Then there is a second circle of regional players which are supporting one ethnic religious community or another. And finally, a third circle of global powers, mainly the U.S. and Russia, but not excluding China. That is, there must be some basic accord among the Syrian parties, some basic accord among the regional parties and some basic accord among the U.S. and Russia and the other permanent members of the U.N. Security Council. Harland acknowledged that the pacification of Bosnia came about after intense bombing of Serbian targets by North Atlantic Treaty Organisation (NATO) air squadrons. “In the case of Syria, I think it’s extremely unlikely that there would be a decisive external intervention,” he said. For one thing, there is a difference of scale: Bosnia is a country of four million people that is very close to Europe and the West, both geographically and in term of interests. Syria has six times that population, and is rather further away, Harland said. Another difference is that the relative power of the United States in 2013 is “less than it was in 1995, when the U.S. intervened militarily in Bosnia,” Harland concluded. It is important to understand the reason we’re seeing negotiations in Syria. The initial domestic conflict was supported and encouraged by outside forces, the US, UK, Qatar, etc. That wasn’t good enough for those who wanted regime change. Foreign fighters and weapons were sent in at an alarming rate. This was a crime against peace according to the Nuremberg Principles (VI, a). The negotiations are a de facto attempt to legitimize those crimes. 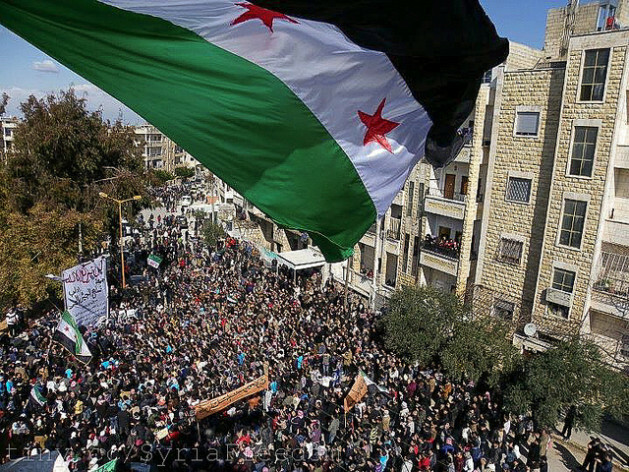 Foreign forces should leave Syria, foreign money should stop, and the Syrians should settle the issues on their own. Alan Kuperman offered important truths about the Libyan effort at the Belfer Center, A Model Humanitarian Intervention? Reassessing NATO’s Libya Campaign. The story in Syria is much the same. Great article. There definitely is not enough attention paid to the critical role outside forces play in the continuation of the Syrian conflict. Neither side can maintain a significant fighting force without outside resources. All parties need to come to the table, including the US and Russia, taking responsibility for their respective roles in the war.